Titchwell Manor Hotel01485 210221work HotelTitchwell Manor Hotel, dating from 1896, is a coastal boutique hotel near Brancaster in north Norfolk with 26 individually designed bedrooms. Three have sea views in the main building, three are large family suites with the remaining 20 rooms set in the main hotel, a traditional cottage annexe or in the contemporary herb garden rooms in the walled gardens. Two of these garden rooms are fitted for disabled guests and some rooms are dog friendly with excellent walks nearby, maps provided. The Titchwell RSPB reserve and Royal West Norfolk Golf Course are both close by. Head Chef Eric Snaith has earned 3 AA rosettes for his excellent modern European cuisine, which uses local produce wherever possible. Vegetarian and dietary requirement options are available. A plentiful array of exquisite dishes is available at Titchwell Manor. Under the guidance of chef/owner Eric Snaith, head chef Chris Mann and his team create accomplished cuisine, from the irresistible ‘Conversation’ menu to the simpler Classics menu. All of the menus can be enjoyed in either of Titchwell Manor’s two restaurants, the candle lit Conservatory, or the more casual Eating Rooms. 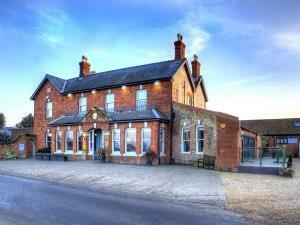 The Snaith Family run a warm friendly hotel, a smart retreat for those seeking fine dining in stylish surroundings, a delightful fusion of contemporary furnishings and traditional values. Titchwell Manor Hotel, dating from 1896, is a coastal boutique hotel near Brancaster in north Norfolk with 26 individually designed bedrooms. Three have sea views in the main building, three are large family suites with the remaining 20 rooms set in the main hotel, a traditional cottage annexe or in the contemporary herb garden rooms in the walled gardens. Two of these garden rooms are fitted for disabled guests and some rooms are dog friendly with excellent walks nearby, maps provided. The Titchwell RSPB reserve and Royal West Norfolk Golf Course are both close by. Follow A149 from Hunstanton, Hotel is between Thornham and Brancaster. From Kings Lynn - 20 miles Station at King's Lynn, travel 20 miles on A149.